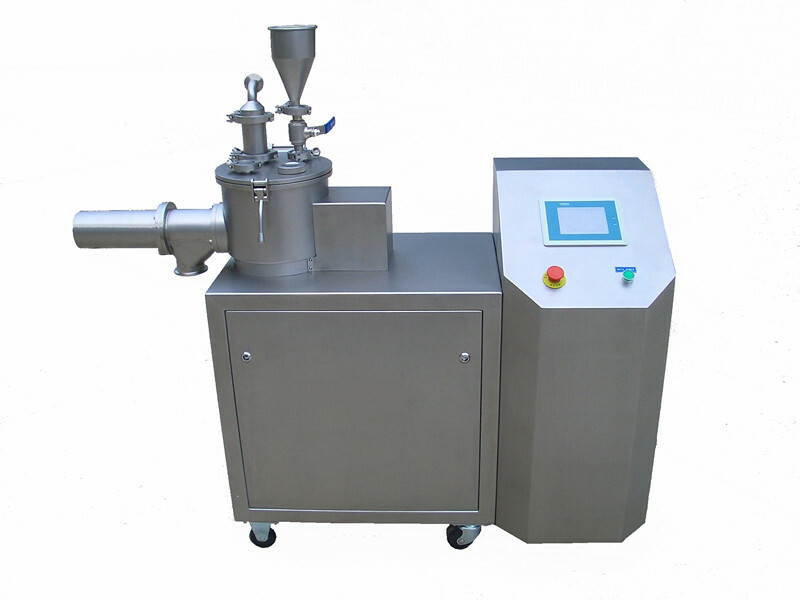 This equipment has got functions of mixing and granulation. Charge the materials manually into the mixing chamber. Start running and operation, under the action of the impeller, the materials will run in a multidimensional shear flow state and thoroughly mixed. Then, the spray gun system sprays the binder solution into the chamber to agglutinate with the materials and, under the combined action of the impeller and chopper, uniform and porous granules are produced. After the granulation process, granules are discharged through the discharge port to the next process. This equipment is successfully designed on the basis of research and development of foreign advanced models. The equipment is made of high quality Austenitic stainless steel, all the corners and angles are rounded off using arc transition technique; the entire machine has no dead leg. On the other hand, it is installed with moveable casters. PLC is designed to ensure fully automatic control. All the operations are automatically completed according to the customer preset parameters; moreover, process parameters can be printed, records of original data are truthfully reliable. LHS Series Laboratory Mixer and Granulator complies with GMP requirements for pharmaceutical production.